Durham area skateboarders are experiencing some serious air. 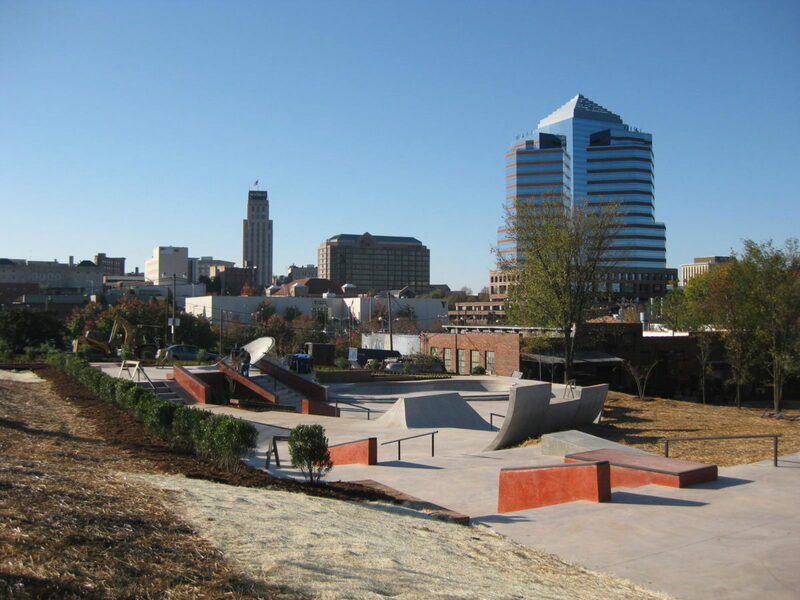 Located at 502 Foster Street in Durham, this skate park features a variety of grade changes and stairs sure to provide local skate enthusiasts with some new thrills. In fact, skaters can test their moves on the floating half quarter pipe, launch boxes, step-up bank, 3-7 step stairs with handrails, a street clam and eight foot trog bowl. The site is in a developed urban park location on a small footprint with over 15 feet of fall across the project area. The challenge was fitting 10,000 square feet of paved skate park area on such a small site, while keeping the project within the limited budget and schedule. This was also the City of Durham’s first design-build project. The park, which contains more “street” type elements and less flow elements than the City of Raleigh Marsh Creek Skate Park, is a concrete structure with brick elements. There are also several vertical components including ledges, walls, stairs and ramps for skating, as well as accessibility. Also involved in the project was Tempe, Arizona-based firm Pillar Design Studios, LLC. The firm has completed various skate park projects including the City of Raleigh Marsh Creek Skate Park.